January has been very slow for doing more work on the house, with a mix of work-tiredness and just january blues making me very slothful and disinclined to do much more than curl up and chill with what little free time I have. This weekend has been the first time that I seem to have found that extra gear and stepped back up to the house renovation work again. With cold winter weather and an old, poorly insulated house, putting up curtain rails was a real priority back in December. 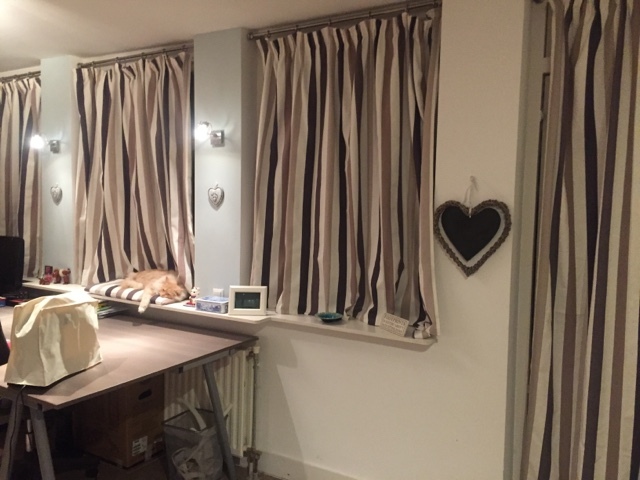 We have a range of old & secondhand curtains that didn't go with the decor which got called into use as soon as the rods were mounted to block the cold cascading from windows and doors. None of them match the decor very well, and all of them are mismatched and variable in terms of size & attachment type(hooks, hoops, rings etc.). Curtain are incredibly easy to make and very expensive to have made to your own design/style choice so I decided to find a fabric store and make my own. I hope that by the end of this blog, you will feel comfortable doing the same. A sewing machine or a passion for handsewing. I have an ancient Toyota sewing machine which I bought in 1993. It is incredibly basic and simple, but refuses to keel over and die, and sews pretty much every fabric I ask it to, leather included. . I keep eyeing up the lovely new machines with embroidery setting and all sorts of fancy stitching, but I can't justify the expenditure given that this machine does everything I need. 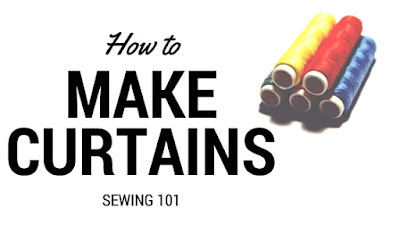 For curtains, you really only need a single straight stitch setting. Choose your fabric based on what you want as the primary effect. 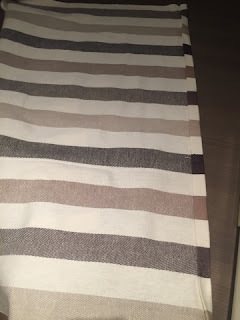 I chose a thick linen striped fabric with lots of weight to keep the cold out, but for light summer use, a fine cotton or even a gauze is enough. 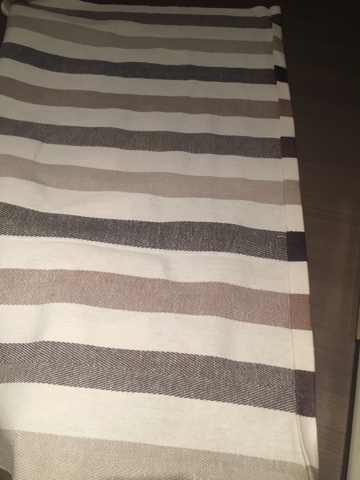 Think about machine washability, particularly for areas like kitchens where the curtains can collect a lot of dirt. If it is machine washable, it's recommended to wash and iron the fabric before you get going. 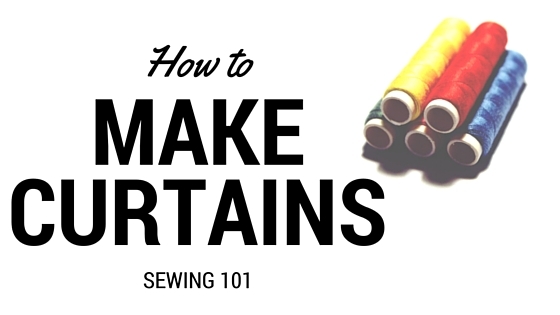 To decide the length of the curtain, measure the height from the curtain rod to the point you want the curtains to finish, and add extra for hems. I usually do a 1 inch wide hem all around, with the fabric turned over twice. I leave the base hemming until after the curtains have been hung for the first time , then pin in situ and remove to hem on the machine. I also leave a little extra for shrinkage after washing, after a few months. It's always easier to move hems, than to start from scratch again. The width is dependent on what sort of attachment or header you chose. The average width calculation is between 1.5 to 3 times the distance you want the curtain to cover. Pencil pleat is the most common style with a general fabric guidance of 1.8 times the width. Depending on the width of your fabric you may have to join multiple sheets together - if you have a repeating pattern or a pattern that needs to be linked up properly, make sure you have enough extra fabric to be able to do it. The header tape is used to form the gathers at the top of the curtain. In the Netherlands there is a basic tape which is used with hooks to create different widths of gathers. I personally prefer the tape that has threads running through it to pull to shape, and the hooks are solely for suspension. There are a wide range of styles, ranging from pencil, to single/double/triple pleated, to goblet style. You need as much tape as the width of the fabric. Once you have all your materials, it's time to measure up and start cutting. I can't recommend enough measuring at least twice before you start to chop into your fabric. I tend to triple check, panic about my base measurements, revisit, measure again and then cut. It's better than getting it wrong and having to buy new fabric. At this point, make sure you have your iron and ironing board on standby and ready. I usually start by fitting together sufficient fabric lengths to make the width needed, pinning and sewing. Although I've been told that if you pin horizontally you can sew over the pins, I tend to pin vertically, and remove them on approach as I sew. I've had more than one needle hit a pin and break the tip off - and I have no wish to be hit by flying shards of metal. Once you've sown the first vertical seam, iron down the seam, separating the two edges to opposite sides. I then pin the two side hems - I usually fold over twice to ensure that there are no fraying edges visible, with each fold being a fingers width wide. After pinning, I always iron - it makes it a piece of cake to sew. The hem at the top, I usually make a bit deeper - closer to two inches to give some weight and form to the pleats - and something solid to attach the header tape to, as it holds the full weight of the curtains. Once all the side hems are done, the top hemmed and header tape attached, it's a case of hanging the curtains and pinning up the bottom hem. I often let them hang for a couple of days to 'settle' into their favoured shape, but it's not really necessary. If the fabric is really light, I'll sew a weight into the corners of the base to keep the curtains from flying around too much in the winds. 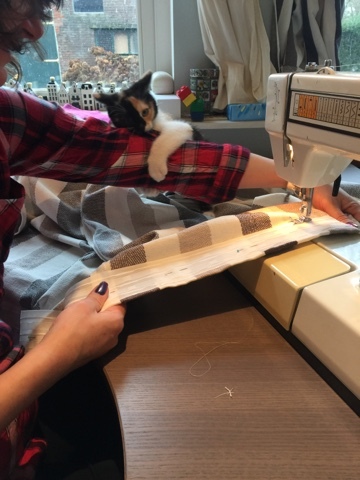 This time around, I had lots of company in my sewing journey - Livia decided that she'd give me a helping hand. She finally fell asleep in the middle of the curtain, which truncated the sewing bee for a while.It's finally all done and I'm super happy with the results : it has given the room a real boost of energy and brings together the blue tones in the room.